Donald R. Laub, MD, an accomplished and thriving plastic and reconstructive surgeon had retired to private practice. In his mid-sixties, he was president of the Gender Dysphoria Program in Palo Alto, California. Then he was diagnosed with an aggressive, potentially lethal brain cancer. His story of his life up to his diagnosis in 2000, as well as his treatment and life post-treatment are well-documented in Second Lives, Second Chances: A Surgeon’s Stories of Transformation. Donald R. Laub was born in 1935 in suburban Milwaukee. To follow in his dad’s footsteps, he intended to be a business major at Marquette University. After just two days he realized business wasn’t for him. He switched to medicine and graduated with an MD from the Marquette University School of Medicine in 1960. He interned at Yale, but followed his mentor, Dr. Chase, for residency at Stanford. While helping a patient, David—who was a health worker who described dismal conditions in a little, local clinic in Mexico—Laub developed a desire for humanitarian aid early on. In 1965, Dr. Laub set his mind to helping people, first in Mexico, while still at Stanford in California. “We’d bring all necessary medical supplies, and the visiting medical personnel would be volunteers.” Interplast was formed. There would be no charge to the impoverished patients, mostly children who would need surgeries such as for cleft lips and palates. In the late sixties, Dr. Laub became involved in the first gender reassignment surgery in California. Torn with his own Catholic beliefs, he had a colleague consult with Pope Paul VI, who consented to gender confirmation surgery. To assure Interplast’s position in Ecuador, Dr. Laub took drastic methods. He managed to transport a fancy gun, destined as a gift for the president of Ecuador, on an Eastern Airlines flight. By 2000, Interplast (now called ReSurge International) was operating in 30 countries, doing 3,000 surgeries a year. But around that time, Laub began to ignore certain physical symptoms. After an initial misdiagnosis—it was thought he had a stroke—Dr. Laub was diagnosed with a rare brain cancer. Though he was treated with stem cells and chemotherapy, he was only given a 15% chance of survival. Happy to have survived cancer, though he could no longer perform surgery, he took to teaching courses at Stanford and consulted for gender dysphoria practices. The remarkable Dr. Laub is now in his eighties and has participated in 1500 cleft lip and palate surgeries during 159 Interplast trips worldwide. He’s done 1500 gender affirmation surgeries as well. The reader will enjoy Dr. Laub’s travels to rural areas around the world with vivid, political, often dangerous and picturesque stories. 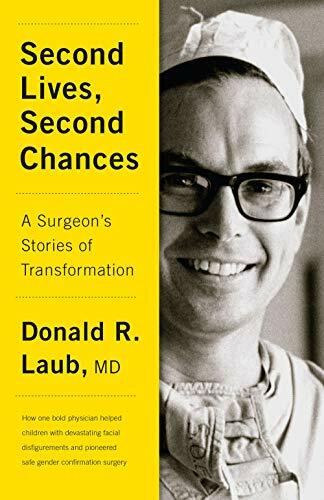 Second Lives, Second Chances: A Surgeon’s Stories of Transformation by Donald R. Laub, MD is a quick read, though it is highly engaging and detailed in medical and philanthropic terms. It is a true story of faith, giving back, and living globally.